Dorothy Parker, Los Angeles, circa 1936.
Who was Dorothy Parker? Read a brief biography here. 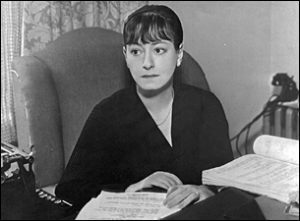 The site that grew into DorothyParker.com was launched in November 1998 to create something unique online: a site devoted to Dorothy Parker’s life in New York. The award-winning writer and peerless wit was a quintessential New Yorker, and that’s what this site celebrates. The site became so popular, so quickly, that in 1999 friends began the Dorothy Parker Society. This led to walking tours. This site takes you to her homes and apartments, the hangouts where Mrs. Parker and the Algonquin Round Table met, and even to a few places you may not have heard about. Have you ever heard Mrs. Parker’s voice? Listen to Dottie reading more than 30 poems. The Constant Reader Book Shop carries books by Dorothy Parker and about her. Interviews are in The Gallery for Parker fans. Our social media active with our Facebook Group and Goodreads Group. Connect with other fans. So mix yourself a highball, throw on some Gershwin classics, and explore Dorothy Parker’s New York. Enjoy your visit. Questions? Drop us a line, we’d love to hear from you!